A new, relatively small, but very multimedia-heavy museum in Berlin about the Berlin Wall and its historical context. Not to be confused with the official Wall memorial site at Bernauer Straße, this is a privately run museum with few original artefacts but plenty of audio-visual elements and other entertainment aspects, and at a rather more entry-level degree of informational depth. But probably good as an introduction to and overview of the topic. More background info: For historical background about the museum's subject matter see under Berlin Wall, under Berlin in general and also under Cold War and related chapters. The museum is the latest addition to the commodification of the stunning story of the Berlin Wall – while the actual Wall has all but disappeared, except for a few relics and fragments, including the East Side Gallery right next door. Apparently this new museum was first announced in November 2014, by none other than Mikhail Gorbachev, on the occasion of the 25th anniversary of the fall of the Wall. It was opened in March 2016 in the presence of a couple of prominent figures. Amongst them Guido Knopp, who has assumed a position that's something like “Mr History” on German TV these days; and apparently he served as an advisor for the development of this museum too. Another celebrity present was Klaus Meine – singer of the German rock band The Scorpions, whose kitsch-laden song “Wind of Change” became a kind of informal anthem of the end of the Cold War and all the political changes of the time … even though it hadn't actually ever been about the Wall and German reunification at all, but was written after a pioneering rock festival in Moscow, featuring Western acts including The Scorpions and other international biggies such as Ozzy Osbourne. This gig took place several months before the Wall came down. So it was more about the initial feeling that change was in the air in mid-1990 in the USSR (just listen to the lyrics and it becomes all too overt). Anyway, it went on to become the most successful single ever to have come out of Germany – and the golden record trophy thus ended up in this museum. What there is to see: On the way up the staircase to the museum you'll already see large blown-up photos of the former Berlin Wall border. When you arrive at the entrance and buy your admission ticket you're also given a tiny piece of the Wall – the typical souvenir sold at so many stalls along the former course of the Wall that you have to wonder for how long you can really trust the pieces are indeed authentic. The piece I was given came with a little “certificate” and was sealed in a bag, so I'll give it the benefit of the doubt. These pieces are only included in regular full-price tickets, though, as was pointed out on a sign. You then enter the museum exhibition proper. Instead of doors between the various rooms you step through “curtains” that are part of the decoration (so it feels like your going through walls). The first section summarizes the period in the run-up to the building of the Berlin Wall. The actual building of the Wall is illustrated with a cement mixer on display (how original! 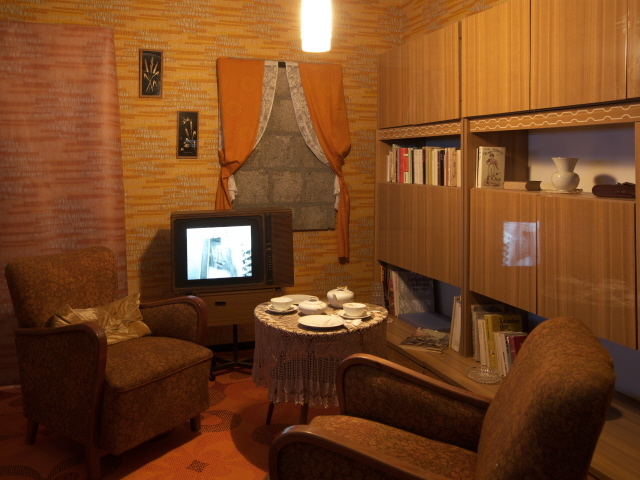 ), and next door to this is the largest set of artefacts of the whole museum: a complete GDR-era living room (of ca. the early 1960s) complete with comfy chairs and a vintage TV set on which period footage is shown. Lined up along the walls here and in the entire museum are about a hundred flat screens that convey the bulk of the information. There are also a few traditional text panels, but these provide only general overviews. Much more text is displayed on screens. And these screens also play various video clips, mostly historic footage as well as interviews, some specifically given for this museum. Everything is bilingual, both the texts and the videos, which are subtitled. The translations into English of the main text panels are sometimes a little clumsy stylistically, and occasionally also not without grammatical faults, but overall they convey their content alright. Interestingly, on all the panels the English version is always given above the German one – so it seems the main target group expected by the museum is foreign visitors (which is quite likely the case). The soundtracks of the videos are played on headphones. When it is in German you can simply read the English subtitles without any need to put on the headphones. But back to the thematic content: moving on in the museum's themes, we come to a section that describes the border security system of the Wall and the whole GDR border in some detail (a single artefact here is a dummy border guard with his gun). Obviously the topic of those killed while attempting to scale that border are a particularly poignant sub-theme here. This border's deadliness is also given special emphasis through a balcony you can step out on overlooking the Spree River below – and text-and-photo panels point out the fate of a number of children who drowned in the river here between 1966 and 1975 … children from West Berlin that is! They had fallen into the river while playing, but because the entire river belonged to the GDR side, the West couldn't help them (for fear of being shot at by the GDR border guards for “violating” the river border) while on the Eastern side nobody made any attempts to assist, so the panel claims. Back inside, the exhibition moves on to the wider historical context, in particular the Cold War and the nuclear arms race. Key moments of this period are specially picked up, such as the Cuba Crisis, the confrontations with tanks at Checkpoint Charlie, the exchange of spies on Glienicke Bridge, or the famous scene of Khrushchev banging his shoe on his desk at the UN in 1960 (although that famous image of him brandishing the shoe is actually a fake, a montage made later). The really scary side of this period is amply illustrated with footage of the nuclear arsenals on both sides including well-known films of nuclear testing (amongst them some gruesome images of singed animals used in such tests). The museum then devotes a lot of space to the last few years of the Cold War and the changes brought about by Gorbachev and Ronald Reagan as the latter moved from calling the USSR “the empire of evil” to actually signing arms reduction treaties with Gorbachev on friendly terms, while Gorbachev crucially initiated reforms within the USSR. Here the tone of the museum becomes so celebratory that it verges on cult-of-personality worship. Some of the (few) artefacts on display in these sections are a little cheesy too – like cheaply made replica missiles that are a long way from looking halfway convincing. As you would expect, much of the exhibition is then devoted to the dramatic events of 1989, when the GDR was beginning to crumble and the diplomatic efforts between West Germany and the Soviet Union were at their peak. There are many personal stories told here, including in particular those of then FRG foreign minister Hans-Dietrich Genscher, e.g. when in a frantic diplomatic mission in New York he once “hijacked” a police car to rush him to a last-minute meeting with his Soviet colleague Eduard Shevardnadze … leaving behind his doctors who had accompanied Genscher with a defibrillator (Genscher had shortly before suffered a heart attack and was actually advised not to travel at all). This defibrillator is on display here and is perhaps the museum's oddest exhibit of the lot. The political road to the eventual reunification of Germany follows, not without mentioning some of the scepticism on the part of some Western allies (especially Great Britain under Margaret Thatcher). The street protests, especially in Leipzig, are covered too, including the fears of a “Chinese solution” (like at Tiananmen Square in June 1989), as well as the increasing exodus of people fleeing from the GDR into the West – especially since Hungary first opened its borders (the first “hole” in the Iron Curtain). The historic moments of the fall of the Wall and reunification the year after are depicted in what I found a rather too glorifying fashion – with lines like “the happiest day of all Germans”. In actual fact it wasn't really all just one big happy party, and many, especially in the GDR, but also in the West, had their reservations about the way reunification was finally achieved and the problems this also created. These, however, are hardly even touched upon here. A kind of “bonus” of especially high entertainment value, on the other hand, is the section about the gigantic live performance of “The Wall” by Roger Waters (ex Pink Floyd) in the summer of 1990 right within the former no man's land of the inner-Berlin border near Potsdamer Platz, after the Berlin Wall had fallen. The room is designed in the album cover's style and excerpts of some of the best moments of that show are played on screens. (It has to pointed out, though, that “The Wall” had not been written about the Berlin Wall; the work's content has nothing to do with it at all, in fact – but the association must have appeared too tempting, especially given that the show included the toppling of a huge wall of oversize polystyrene “bricks”). Eventually you come out in the museum foyer where there are a few more artefacts, including a copy (I presume not the original) of the Nobel Peace Prize document that was given to Mikhail Gorbachev in 1990. There's also a guest book and a souvenir/museum shop. All in all: I couldn't help but getting the feeling that this museum was a bit too entertainment-oriented and rather superficial in content. If you're familiar with the history of the Wall and how it came down, you won't learn much that is new here (except for a few intriguing anecdotes), but for those not so familiar with it this is a good introduction that does not overwhelm with too much detail. From a practical point of view, I'm wondering how well the museum could cope with larger visitor numbers. When I was there I arrived just as they were opening (in fact I had to wait a few minutes), so I was the first visitor of that day and basically had the entire museum to myself. Since so much of the museum is reliant on screens and headphones, however, I could see this becoming a problem once many people compete for access to these screens and headphones. Finally, the admission fee for such a small museum, with so few artefacts (even though it is fairly hi-tech on the audio-visual front) can be considered overpriced. But those caveats aside, it is still a worthwhile addition to Berlin's Wall-themed attractions, in particular for international visitors. Location: right by the southern end of the famous East Side Gallery and the eastern end of the iconic Oberbaumbrücke, inside the former Mühlenspeicher warehouse (now a hostel and restaurant complex) at Mühlenstraße 78-80, in the Berlin district of Friedrichshain. Access and costs: slightly hidden but not too difficult to find; very expensive for such a small museum. Details: getting to the museum is not too difficult, even though it is in a slightly hidden location: on the second floor of the former Mühlenspeicher warehouse by the Spree River. Most of this is now a kind of hip restaurant, on a “pirate” theme it appears, and all that is much more obvious than the museum. But there are sufficient signs pointing you in the right direction – including a Trabbi car with the museum's logo on it. Opening times: daily 10 a.m. to 7 p.m.
Time required: between half an hour and over a full hour (if you want to watch and read everything). Combinations with other dark destinations: in general see under Berlin, and especially Berlin Wall. The East Side Gallery, which is directly adjacent to the museum, is the most obvious combination here, of course. Thematically, though, the official memorial to the Berlin Wall at Bernauer Straße should be the most suitable combination. Combinations with non-dark destinations: see under Berlin – the nearby stations Warschauer Straße and Schlesisches Tor provide good transport links, by metro (U1) to the west of the city and by regional metro train (S-Bahn) to Alexanderplatz, Mitte and the central station (Hauptbahnhof).